Chung — who speaks English, Spanish, and Korean — has worked as a teacher, a research assistant, and a school counseling intern. In addition to being a graduate student, she is a counseling psychology doctoral intern at the Brookline Community Mental Health Center. 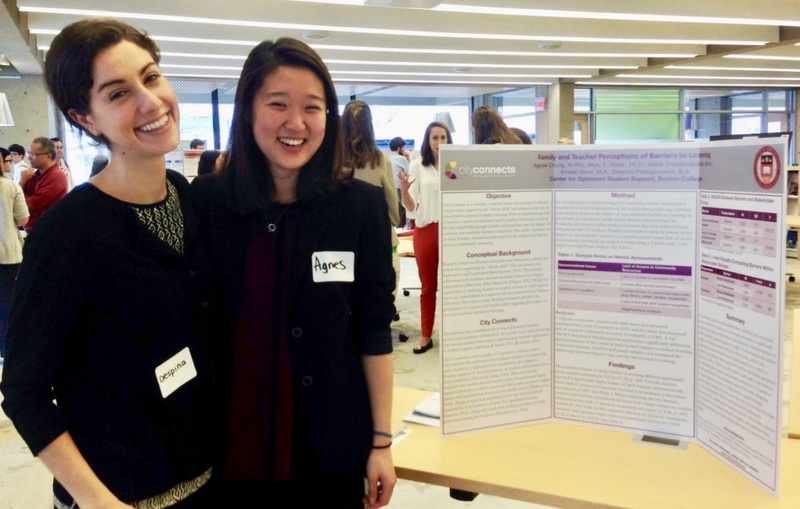 Chung’s poster, “Family and Teacher Perceptions of Barriers to Learning,” looks at whether teachers and families have different perceptions about two barriers: socioemotional issues and lack of access to community resources. The findings? Parents and teachers agreed that these two factors can hurt student achievement, but they differed on which factor had the most impact. Teachers said socioemotional issues were the biggest barrier for students. Parents said that lack of access to community services were. Given “the evidence that student support efforts are most effective when home, school, and community environments work collaboratively, it is critical to identify and address discrepancies in teacher and family perceptions,” the poster explains. The other poster was shared by Mitra. She is interested in international affairs, and her past work includes the monitoring and evaluation of programs and policies in education, poverty alleviation, and the environment. After she graduates, she would like to evaluate literacy-related programs and policies in developing countries. Mitra’s poster has a long name — “Preliminary findings from a literature review on the conception, measurement, and outcomes of fidelity systems to support the development and validation of the City Connects Fidelity System” – but a simple goal. It presents the results of a literature review of research on how to assess whether the City Connects model is being faithfully implemented. This research on the research can help improve the ways that City Connects monitors and supports implementation in schools and identify areas for improvement. Mitra’s work also has implications for the field of implementation science and how scientists and practitioners can know whether an intervention is being put on the ground as intended. And, of course, in schools, greater fidelity to the City Connects model means maximizing students’ success.